I know if anyone had asked me in which state is the largest solar electricity system based on any factor I would simply say California to be safe.Â New Jersey is coming in with a lot of solar installations, but I have always just assumed that the biggest PV systems in any category would be located inside the State of California.Â So it was a huge surprise to me to discover that the largest solar installation in any urban city in the US is actually in the City of Chicago and very close to Lake Michigan.Â It is on the South Side of Chicago and not very far from where the Chicago White Sox play baseball.Â It is 10 MW so it is a large system for anywhere, but it is huge for a location within an urban US city. 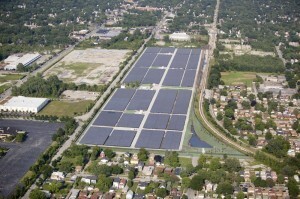 Exelon (the owner of ComEd) completed work on the installation recently and the dedication was on July 21, 2010.Â SunPower actually manufactured the solar panels and did a lot of the installation work along with the local IBEW in Chicago, and Turner Construction.Â It is located at West 120th Street on 41 acres of ground that was a â€œbrownfieldâ€ site and vacant for more than 30 years.Â It now has 32,292 solar panels that convert the sunâ€™s rays into clean electricity with zero carbon emissions. Because it is a â€œbrownfieldâ€ site there is a berm around the entire 41 acres as well as a fence and video cameras for security.Â The site is now productive, but the water runoff is still controlled so that no water hits the site and then flows off site.Â All runoff remains on the site. 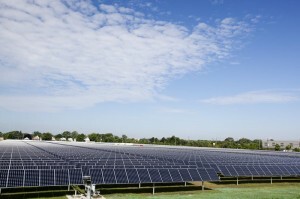 The SunPower system has number of trackers that keep the solar panels facing the sun.Â So in the morning, the solar panels face the East to catch the morning sun.Â In the afternoon, the solar panels face the West to catch the afternoon sun and in the middle of the day most of the 32,000 solar panels face south to catch the midday sun.Â It is an amazing site to see these solar panels gradually turning and following the sun every day. 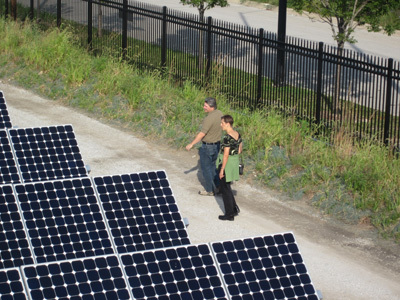 As part of the project SunPower has agreed to donate â€œsolar schoolâ€ projectsÂ to local Chicago Public Schools so there will be 5 schools with over 2 kW each to add to the Illinois Solar Schools web site. Â The schools have been selected, and construction and permitting has begun. 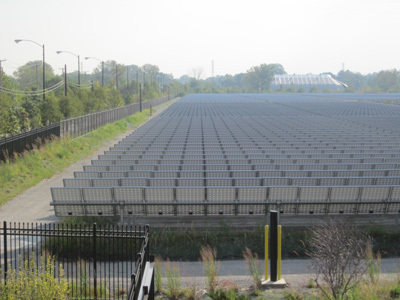 An interesting note: the voltage of the electricity generated by the solar array is 245 watts AC.Â Since all of the electricity has to go into the ComEd power grid which operates at 12,000 watts.Â This means the voltage is stepped up on the site from 245 to 12,000 before it flows out onto the power grid and supplies electricity for homes and businesses on the south side of Chicago. 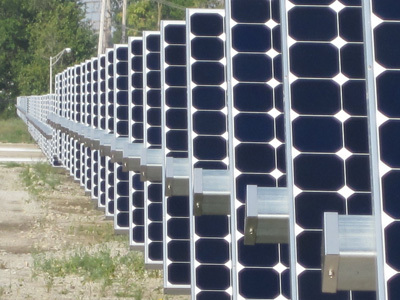 Another interesting note:Â the array supplies the electricity for the equivalent of about 1,500 homes. Another interesting note:Â the vacant site generated virtually no revenue for the City of Chicago for the past 30 years and it is doubtful that anything would have ever been built on the site because of the tremendous cost of â€œfixingâ€ the environmental problems on the site.Â Today the site is generating revenue for the City of Chicago. 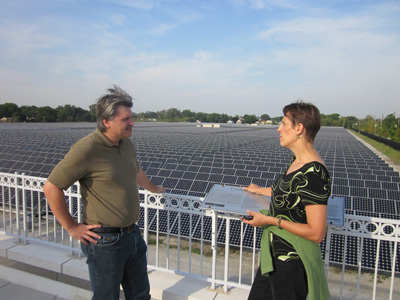 This entry was posted on Friday, April 1st, 2011 at 10:21 am and is filed under Illinois, Solar Schools, SunPower . You can follow any responses to this entry through the RSS 2.0 feed. You can leave a response, or trackback from your own site.